It's therefore no surprise that we at Google are very supportive of organizations that seek to streamline access to and simplify the sharing of geospatial data. One such organization is the National States Geographic Information Council (NSGIC), the association of U.S. state government GIS agencies. Among NSGIC members' objectives is coordinating the collection and sharing of data within their jurisdictions. Because of the efforts of many NSGIC members, we've managed to efficiently add aerial imagery and other datasets for entire states to our services. 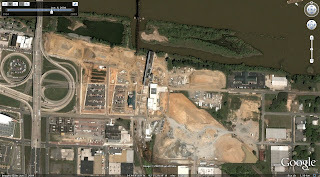 For example, the State of Arkansas improved the resolution and currency of imagery statewide. 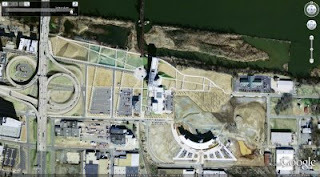 The following screenshots, taken from Google Earth's Historical Imagery feature, show the Clinton Presidential Library in Little Rock, Arkansas, while under construction and following its dedication. The latter view was provided by the State of Arkansas. Another NSGIC objective, shared by U.S. federal agencies and others, is producing nationwide datasets as part of a National Spatial Data Infrastructure, such as through the Imagery for the Nation program. We've joined others in the technology industry in endorsing such efforts. NSGIC recently held a conference in Annapolis, Maryland, where we had the opportunity to present to the association's state government members. The purpose of our presentation was to address the recurring questions we get from GIS agencies about the types of geosptial data we welcome and the steps involved in partnering with us. One result is that we've published answers to an initial group of questions and we'll be adding others soon.